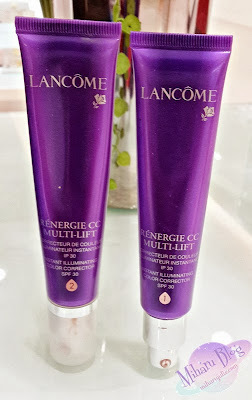 Before I go into my review, let me summarize a little bit about Renergie CC Multi-Lift. The new illuminating skincare. Lancôme creates our first colour correcting skincare for skin that feels immediately smooth and appears more unified. This is an instant illuminating color corrector with SPF30 PA++. Lancôme stated that this CC Cream capture the power of light to reveal your skin's youth. With Renergie CC Multi-Lift, skin instantly feels denser and firmer, skin color is corrected and illuminated. The skin is beautifully lifted and even and looks years younger. From the Lancôme US website, there are 4 shades (1, 2, 3, 4) but here in Indonesia, we only get 2 shades (1, 2). Earlier in January, Lancome rolled out a new exciting alternative to our beloved BB Cream – each came up with its own version of the highly anticipated CC Cream. Touted as a one-up on the BB, CC Creams give better coverage, yet remain light on the skin. 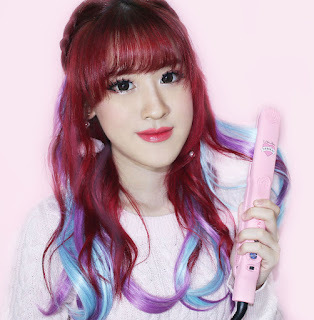 It also disguises blemishes, spots and corrects your skin tone (it can help mask redness and sallowness). CC Creams are also considered an all-in-one makeup and skincare product loaded with anti-aging, moisturising and sun protection properties. Some even target specific concerns like fine lines and work to improve skin texture. 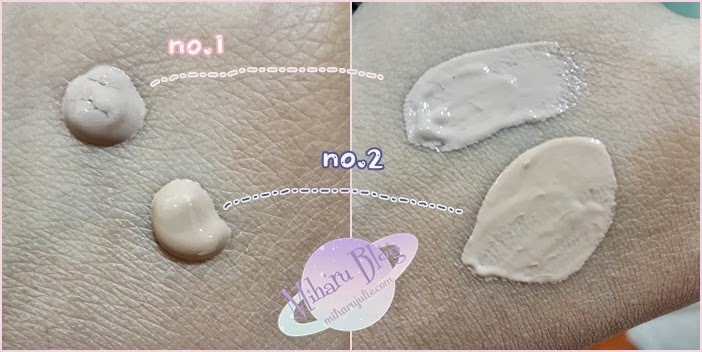 In comparison, the BB is a thinner formula although both can be used alone or as a primer before your base (foundation or powder). 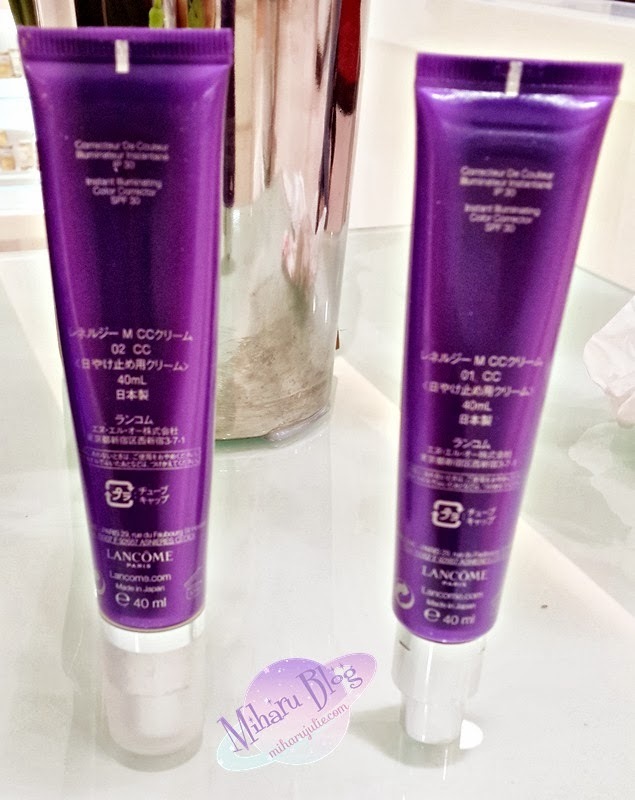 It comes in a purple tube and the product comes out via a pump dispenser. The CC cream looks slightly greyish. The consistency is very smooth. It spreads easily and blends into my skintone. 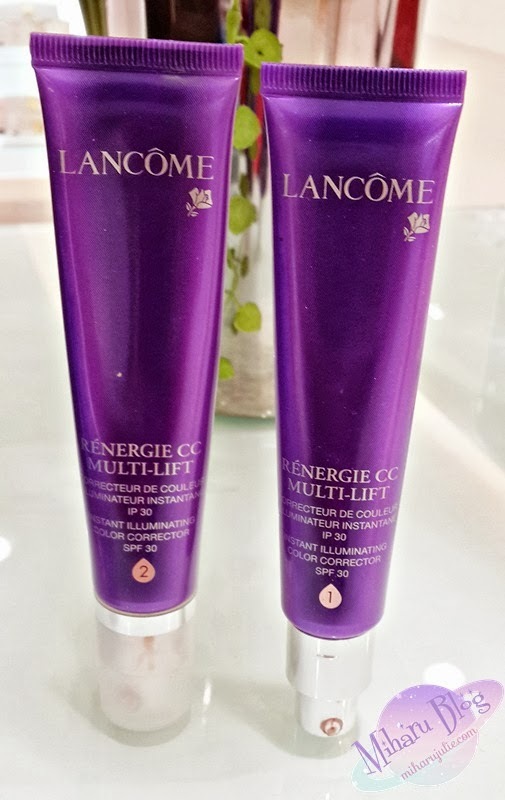 How to use Renergie CC Multi-Lift? Apply 1-2 pumps in the morning to finalize your Renergie skincare routine. I love the end results - very brightening, and very natural. I feel that it is not sticky and thick like the current BB cream I'm using. I don't know about the price, because my aunt bought it for me. But i think lancome product always have a expensive price. Packaging and Design: No interesting. I wish the design was more interesting .